When we think of the cities that are “most walkable,” it’s often in terms of pedestrian networks such as sidewalks and trails. However, there’s another factor at play in determining which cities are truly most pedestrian-friendly: accessibility. 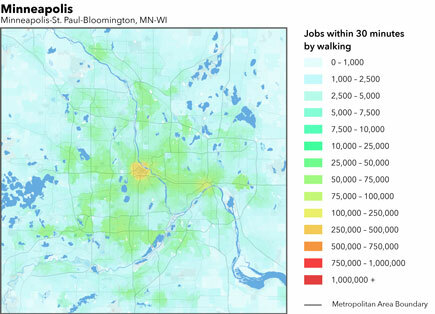 In a new report in the Access Across America series from the U of M’s Accessibility Observatory, researchers ranked accessibility to jobs by walking in the 50 largest (by population) metropolitan areas in the United States. Currently, walking is the third most widely used commute mode after driving and transit, accounting for around 2.8 percent of commute trips nationally and 5 percent within large cities. The rankings were determined using a weighted average of accessibility, giving a higher weight to closer jobs. Jobs reachable within 10 minutes were weighted most heavily, and then were given decreasing weights as walking travel time increased up to 60 minutes. The report—Access Across America: Walking 2014 —presents detailed accessibility values for each metropolitan area, as well as block-level maps illustrating the spatial patterns of accessibility within each area. The cities that make up the top 10 all have a combination of employment density and fast, frequent transit service. “Employment density is a primary factor in whether an area is economically walkable or not, and employment densities are typically high in cities that employ heavy rail systems leading into a central core,” Owens says. “In this way, transit systems promote walkability and walking accessibility, without requiring a user to board a transit vehicle to experience the positive effects. The research was sponsored by CTS and CEGE. The new report is a companion study to previous Access Across America reports on transit and auto accessibility. Reports and accessibility maps from the latest study are available on the Accessibility Observatory website.